We rode a couple of more bike rallies on the mountain bikes, but it was becoming clear that if road bike riding was to be the sport we wanted it to be, we would need to move up to road bikes. I knew very little about bikes at all, certainly nothing about road bikes, but I started reading about bikes both in printed literature and via the internet. In October 2006, I went to an estate sale and ran across this 1983 Trek 510. I absolutely could not pass it up, since the price tag was a measely $5.00! 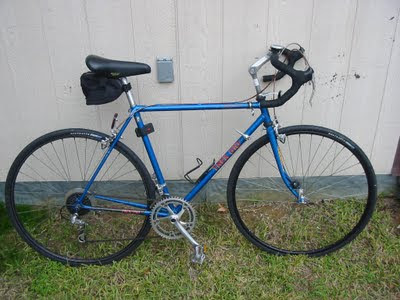 I knew enough to know that Trek was a quality brand, and the bike had obviously been well cared for; it had all original components, right down to the Avocet leather seat, and even the leather was in great shape! I updated the stem and bars, put on new tires and tubes and eventually upgraded the saddle. I started taking longer rides on this bike, and in 2007 completed my first century at the Hotter 'N Hell Hundred in Wichita Falls, Texas. It was difficult, and I could never have made it without my son T.J. pulling me along, but I did finish it, and that was when I really felt like I could call myself a "cyclist", and I also felt like I was fully recovered from having stents put in my heart the year before.